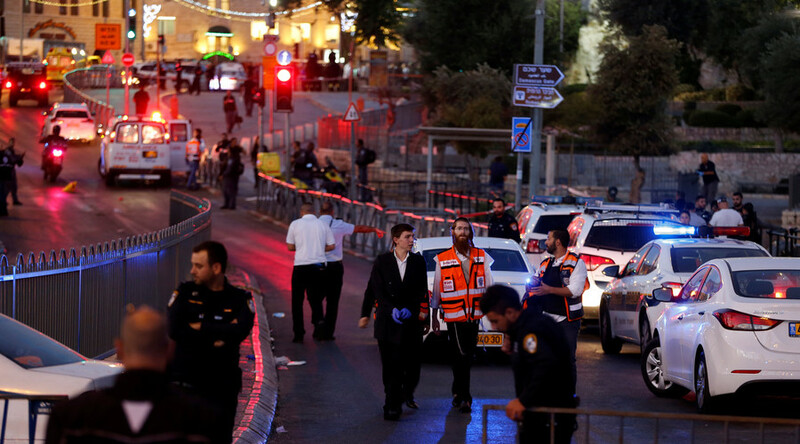 A 23 year-old female Israeli border guard is dead, and four others are injured after a simultaneous knife and gun assaults in the historic city center of Jerusalem. All three assailants, who have been named as three Palestinian men, have been killed. Islamic State (IS, formerly ISIS, ISIL) has claimed responsibility for the attack through its propaganda media outlet Amaq, vowing that it would "not be the last," Reuters reported. The ISIS claim was disputed by Hamas, which said that the terror group falsely took credit for the stabbing and gun attack “to muddy the water,” according to Hamas spokesman Sami Abou Zouhri, as cited by AFP. Israeli media reported that in one of the incidents, close to Damascus Gate, the attackers rushed at a group of border guards, with one brandishing a homemade submachine gun, which reportedly jammed. In the other, one assailant critically stabbed border guard Hadas Malka, who was serving at a spot that has become notorious for frequent attacks. Malka was taken to hospital, where emergency surgery was unsuccessfully performed to try and save her life. Two others are being treated for light injures, and two have sustained moderate wounds, with some reporting that bystanders were grazed by police bullets. Palestinian media said that the three attackers were Adel Ankush, 18, and Bra’a Salah, 18, from a village near Ramallah, and Amar Bedui, 31 from Hebron. Yoram Halevy, the Jerusalem police chief, said that the attackers exploited the easier permit regime instituted for the Muslim holy month of Ramadan, designed to make it easier for thousands of Palestinians to make a pilgrimage to Jerusalem. “During Ramadan there are large numbers of Palestinian youths who enter without permits, they take advantage of Ramadan to be in Jerusalem,” said Halevy, who noted that the youths probably arrived earlier on Friday. “This is what we get as a result." Hamas, the Palestinian group that controls Gaza, praised the fatal stabbing. “The attack in Jerusalem is new proof that the Palestinian people continues its revolution against the occupiers and that the intifada will continue until complete freedom is achieved,” it said in a statement. Israel says that over 160 Palestinians have been killed while attempting to stab, shoot or ram Jewish citizens with vehicles since 2015, in a waxing and waning standoff that has become known as the Stabbing Intifada. More than 40 Israelis and foreigners have perished in the incidents.